This easy to make and delicious Veg Paneer Roll makes for a perfect lunch, evening snack or a light dinner. 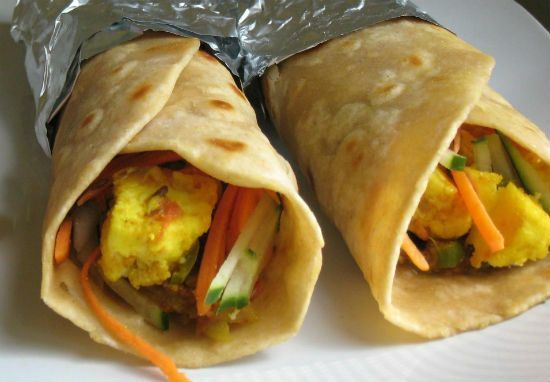 Made with grated paneer and vegetables cooked in spices and then wrapped in a chapati (or a tortilla), they are a popular street food item these days. 2. Fry the saunf and cumin seeds for 30 seconds. 3. Add the onions and green chillies. 4. Saute for a minute or until onions turn light golden. 5. Add the ginger garlic paste and stir well for 30 to 40 seconds. 6. Add the capsicums, carrots and saute for another minute. 7. Add the tomatoes and cook for one more minute. 8. Add red chilli powder, curry powder and salt. 10. Add the grated paneer, cucumber and garam masala powder. 11. Cook for a minute or two on low-medium flame. 12. Garnish with coriander leaves and switch off the flame. 13. Heat a tawa over medium flame. 14. Warm the chapatis (or tortillas). 15. Add some of the paneer vegetable mixture. 16. Roll the chapati tightly. Feel free to comment or share your thoughts on this Veg Paneer Roll Recipe from Awesome Cuisine.